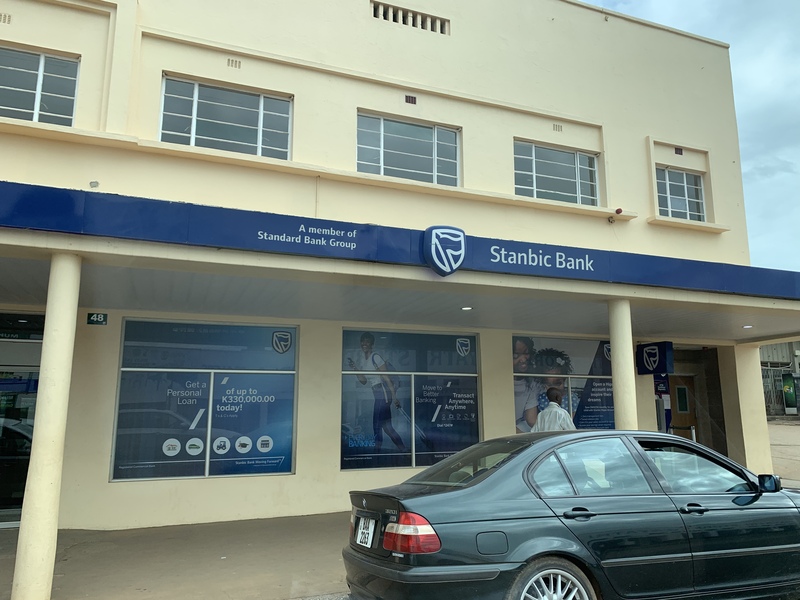 Stanbic Bank, infamous for destroying Zambian owned businesses , has now embarked on a program to exploit small scale farmers by loaning them equipment which they probably don’t even need. Under the scam, Stanbic will be leasing tractors, forklifts and other equipment to farmers but tell the farmers to sign off their crops as collateral. In short, both the crop and equipment will belong to Stanbic. After using the tractor, the farmer will return the tractor to the bank. After the harvest, the crops will be sold to pay the bank for using their tractor, whether the farmer will record good harvest or not. The farmer will only get the change from the sale of his crops since legally, the crop wi belong to Stanbic. If the yields are not enough, the farmer will remain indebted to Stanbic. But since Stanbic is tainted and the whole country now knows that the bank makes profits by such scams, Stanbic is not leasing these equipment to farmers directly. The predator bank has engaged middlemen to do their dirty work. One such middleman that has been engaged to exploit farmers on behalf of Stanbic is Keegy Zambia limited owned by a conman called Chongo Kasongole. According to Kasongole, ‘Under the leasing programme, Keegy provides the equipment on a temporary lease basis, to allow farmers to use the machinery to improve their production, and return it after a specific period.’ Kasongole disclosed this to journalists but did not explain the monetary obligations farmers are subjected to. “We also offer our clients the option of clients selling their equipment back to us, which also helps them raise extra income,” Kasongole said. But that is how Stanbic operates. There is really no option. It’s part of the tactics used by the bank to make clients work for them, pay off the loan in full then grab the equipment. That is what Stanbic did to Costain Chilala who was once the most accomplished Zambian farmer but now almost a destitute due to Stanbic exploitation. Chilala was enticed by Stanbic to obtain but ended up losing his Chimsoro farms after Stanbic sold them to fellow South Africans. Stanbic is also exploiting miners and civil Servants especially teachers by offering them loans but changing rules when the clients are about to complete paying back. In short, when you get a loan from Stanbic, you are in for good; you will continue paying in perpetuity until you lose everything to Stanbic. So many people are crying. A youthful female farmer Miyanda Katiwa recently lost her farm and green house to Stanbic under the same scams Stanbic calls loans. Stanbic Zambia ltd is holding on to two securities belonging to Savenda Management Services, according to sources within Stanbic. In both cases, Stanbic has been paid in full. The first issue involves the well known case where Savenda Management Services entered into a lease buy-back facility for a US$540,000 to buy a printing machine. Savenda provided title deeds to its offices as security. Stanbic sources say it was agreed that Savenda would be making Monthly repayments by debit order from one of the company’s bank accounts. But, due to a faulty in the system of Stanbic Bank, Savenda’s instructions on the debit order were sent to the wrong account within Stanbic. Stanbic wrote to Savenda explaining the problem and saying it had been sorted out. But during this same period and amid this confusion, Stanbic decided to report Savenda to the Credit Reference bureau (CRB) as a bad debtor. Stanbic later claimed that the account was still in arrears of $80,000 worth of instalments. The matter went to arbitration where the arbitrator current Supreme Court judge Charles Kajimanga awarded Stanbic US$1.36 million. Judge Kajimanga, who was picked by Stanbic as arbitrator only gave Savenda 60 days to pay the US$1.36 million or else the bank should foreclose, that is grab, and sale the offices for Savenda. Savenda, a local business pleaded with judges to be allowed to pay this arbitral award in instalments, but the Zambian courts refused. All this was collusion between Stanbic and named judges to destroy Savenda. Why would local courts give a local company only 60 days to pay a multilateral bank like Stanbic only 2 months to pay US$1.36 million? Note that, after the arbitration, Savenda took the matter to the High Court counterclaiming K192 million as loss of business. In the High Court, Savenda won after the court found that the problem was not that Savenda was failing to pay but faulty lay with the bank’s system. Despite this, Savenda paid Stanbic the US$1.36 million as ordered by the arbitrator. Yet, upto now, Stanbic is holding on to the title deeds that were surrendered to the bank as security. The second case involves a personal loan which Savenda management services Managing director Mr. Clever Mpoha obtained from Stanbic. Sources within Stanbic explain that Mr Mpoha obtained a personal loan for K747, 000 to be paid over a period of 10 years. The loan was for building a house. When he had paid about K252, 000, Stanbic decided to recall the loan and demand that he pays all the remaining amount immediately. According to bank insiders, the Bank decided to recall the loan as punishment as at the same time Savenda was taken to arbitration. Mr Mpoha however obliged and paid the balance in full though when calculations were done, it was discovered that he paid more than what was on the agreement. But when he went to collect his title deeds, the bank refused. Stanbic gave him another bill. He was told he owed the bank K501, 000 in legal fees. As of of today 8 January 2019, Stanbic is still clinging on to the title deeds not for nothing but with sinister intentions of grabbing these properties one way or the other. This is the bank that is now targeting peasant farmers using agents, third parties and all sorts and colours of middlemen. Our advise to Chongo Kasongole and his Keegy outfit, tread carefully. This is Stanbic Bank. Hopefully you won’t lose even your blankets when they turn against you.